NARRATOR: On this episode of The Rural Golfer, our host gets hosted. 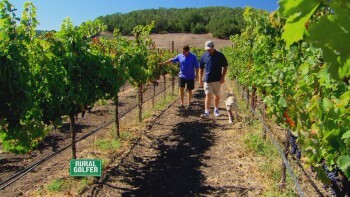 STEVE ELKINGTON: I don't know if I've ever been in a place as quaint as Sonoma. NARRATOR: --as the Grieves toast to Elk in wine country. -And your place-- I just don't know if you could ever get a better spot to live. NARRATOR: He samples the flavor of one of the world's finest wine-producing regions. -Can anyone grow grapes? I mean, how do you grow them? -I think you got to be a freak to have a vineyard in the first place. NARRATOR: --and finds out that the secret isn't in the dirt, it is the dirt. -The only way to have a living soil to produce the nutrients that we want feeding our grapes is to do it organically. NARRATOR: And Elk just has to go about dejuicing grapes the organic way. -All right, I'm ready to get into this. NARRATOR: The Rural Golfer is headed your way. THEME SONG: We've got the big show ribbon that rides around the map. Where we're going next, we just can't say. Let's grab the clubs, let's hit some balls. We're making friends and playing golf. The Rural Golfer's coming your way. NARRATOR 2: Northern California is synonymous with the City by the Bay. But keep heading north and you'll find a part of the country that is home to the most intoxicating vistas around and tastiest grapes to be found. Welcome to Sonoma, California. We're not just in God's Country here. We're in the nectar of the God's Country. Most times, a successful business begins with a firm initial plan. For Midwest transplants David and Kathleen Grieve, it began with a barn, a horse, and absolutely no plan. DAVID GRIEVE: We had no idea what we were doing. We did it like a lot of things in our life. We backed into it. We bought a house in Sonoma. And it was the perfect house. The parcel that we bought had been carved out of an original 70 acres. Those other 60 acres from the 10 acre piece that we bought came up for sale about a year after we bought it. We looked at it. And there were 20 acres planted with grapes. And we just decided to go for it. We figured we could figure it out as we went along. And we did. The first harvest was phenomenal. I mean, we picked the grapes. We actually were selling to another winery at that point. They ended up doing really well with the wine. And you know, we thought we had something. And I had a neighbor. We got together and he said let's make some wine. And so we ended up literally doing everything in our barn for our own use. And the wine turned out great. -All right, what is that? NARRATOR 2: --but an undeniable drive got them in the game. And that drive has been the difference between success and sour grapes. -If you're in the game, you just keep plodding along, you'll make money as long as you're-- you know-- you're pushing every day. And something will come along. And you'll figure it out if you're smart. And you know I've always been a big believer of that. NARRATOR 2: Although it's touted as an overall easy process, a premium on precision when making wine is everything. -Making wine as a whole is one of the most simple processes there is in the world The basic chemistry of turning grape juice into wine is simple. You add yeast. Yeast eats the sugar, creates CO2 which goes away in a still wine, and it creates alcohol. But to get it right-- to get it where you have that sip of that wine and you want that next one so bad-- that is the hard part. NARRATOR 2: Much like the very foundation on which the game of golf is learned and played, the secret lies in the dirt. VANCE ROSE: It's always in the dirt. It really is. And for us, the only way to have a living soil to produce the nutrients that we want feeding our grape is to do it organically. There really is for us not another way to go about it. The way that you feed the soil and keep that soil alive with that biodiversity is extremely important. And planning legumes during the winter to drive nitrogen into the soil to putting grape pumice back into the soil to up its organic matter-- most people don't understand about a grape vine. There are two parts to it. There's the root stock and then there's what we see above ground. And certain root stocks will do certain things with certain grape varietals. And certain root stocks do better in certain soils. So it's very, very important to match that specific root stock for the varietal that you have, for the climate that you have, and for the style of wine that you make. -It's not a really easy place because of the weather conditions and the type of soil and stuff. The grapes actually have to struggle. And I think it builds character in the grapes and later the wine that's produced from them. NARRATOR 2: From there, the process is a year long routine which culminates with a single, special day. MIKE MCGRANE: Our guys take a lot of pride in and the harvest day because you can see what your whole year's work has amounted to. VANCE ROSE: I try to take different pieces-- Cabernet Sauvignon, Merlot, Cabernet Franc-- and blend those together to make the best wine that we can possibly make that when people drink it, they jump for joy. That's it. We are not doing anything but putting a smile on people's face. STEVE ELKINGTON: This is the Sauvignon Blanc wine. DAVID GRIEVE: This is just Sauvignon Blanc grapes. And that's what makes Sauvignon wine. 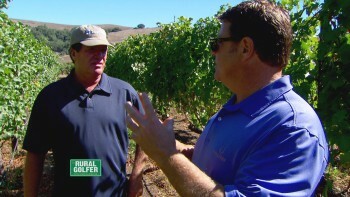 STEVE ELKINGTON: What is Sauvignon Blanc? DAVID GRIEVE: It's a type of grape. VANCE ROSE: When you say Sauvignon Blanc, most people think there's just one Sauvignon Blanc. And there isn't. There are many different clones of Sauvignon Blanc, Merlot, Cabernet Sauvignon, Chardonnay. And so matching that clone with that root stock, with that climate, is what can take you from making OK wine or average wine to good wine to great wine to Grieve. STEVE ELKINGTON: So that that cloning thing means its all pre-mixed into the roots. It's already in there. They're all mixed in. And you just add that to it. The stick them together, put it in the ground, and all that magic comes out. DAVID GRIEVE: Right. Well the vine is grafted to the root. STEVE ELKINGTON: I'm feeling like this is sort of like the little miniature Magnolia Lane of your farm right here. STEVE ELKINGTON: Real family winery you got here, right? STEVE ELKINGTON: I don't really-- the reason why I came out here to visit you is I want to learn about it. I got to learn some things from you today. DAVID GRIEVE: We're going to teach you. DAVID GRIEVE: We're going to talk all about wine. STEVE ELKINGTON: What is that? -That is Merlot. It's part of the Bordeaux varietals. STEVE ELKINGTON: That looks delicious. DAVID GRIEVE: What you're also looking at is you've got a beautiful bunch there, but also notice that the berries are pretty small. STEVE ELKINGTON: What does that mean? What-- I was thinking they'd be big. DAVID GRIEVE: The smaller the berry, usually the more potent and the more intensity of flavor. Little means more skin contact. DAVID GRIEVE: Skin contact to the pulp inside, all right? So you want more skin because a lot of the flavor is extracted from the skin. -Less sugar and usually the wines are aged a lot longer. So Elk, we have a little tradition here at Grieve Family winery. Every year after we harvest the grapes, we start the press with a traditional press. And we're going to do it old school with our toes. -Let's do this-- ho, ho! All right, I'm ready to get into this, baby. -All right, I could-- I like it. Gotta get to the edges. -The process is relatively simple. We squish the grape and we press them. Then we put it in specially made barrels. And we age it for seven or eight months. And then we bottle it. So it's a simple process. -Do I really want either one of those two guys treading my grapes? No way! I know where their feet have been. STEVE ELKINGTON: Alright, next stop on the farm-- organic stuff-- bit in California, isn't it? -People out here are very, very environmentally sensitive. They're probably the leaders of everywhere, wouldn't you say? DAVID GRIEVE: I would say that we're probably the most progressive. NARRATOR 2: In an ever changing and more mindful world, living organically is seemingly the new norm. VANCE ROSE: I think that there was a great shift in grape growing and a great shift in wine making in the 1950s. And the reason for that was the nuclear age. The Agra chemicals were coming on at that point in time. And it-- you know, people thought gosh, it's so much easier to come through here and spray to get rid of that pest that might be a problem down the line. And then we look at it after 10 and 15 and 20 years of application-- with pesticides and herbicides, we were killing the soil. NARRATOR 2: Pulling life from the soil and farming organically was really a no-brainer at the Grieve Family Winery. VANCE ROSE: Where these grapes are getting their flavor is from the soil. And if you add chemicals in that soil, you're killing nutrients in that soil. -Well, the good and bad about our vineyard is that we have very low yields here. And that's about the climate and the soil. -I think it comes down to paying closer attention to the grape vine. And then ultimately, the more attention you pay to the details in the vineyard, you're able to follow the grape through the year and produce the best grapes possible with the lowest amount of inputs from man-made chemicals. -You've got chickens and everything-- goats, pigs. -Is that what they call it? A set? DAVID GRIEVE: A set? Uh, no. STEVE ELKINGTON: It's not? It's not a set? DAVID GRIEVE: I think it's like a flock. -So here at the Grieve Family Winery-- and the beautiful Kathleen, your better half-- very, very organic, friendly environmental people. And you have chickens? KATHLEEN GRIEVE: Yes, we have chickens. -There's some Araucana Americana mixes. There's Buff Orpington. And then my favorite are these Copper Marans, which are the black ones. STEVE ELKINGTON: That's called Copper Maran? STEVE ELKINGTON: I love that. And what have you got, a dozen or so? That's plenty of eggs, right? KATHLEEN GRIEVE: I think we have nine right now. Yep, plenty of-- plenty of eggs. STEVE ELKINGTON: This is a roost? -Oh, you've got your little boxes. -Huh? Little boxes. Oh, oh. You've got plenty of eggs. STEVE ELKINGTON: He wasn't into it? KATHLEEN GRIEVE: --concept. Well he didn't know that it would be so much different than store-bought until we had them. STEVE ELKINGTON: It is. It's so different, huh? -And you have some lawn mowers down there. STEVE ELKINGTON: So you can come over and they chew your grass off. STEVE ELKINGTON: It is, really? What about this one, here? STEVE ELKINGTON: Is this a growth? KATHLEEN GRIEVE: It's a Jacob sheep. And the females have two horns and the males have four. STEVE ELKINGTON: It's another set. DAVID GRIEVE: It's a set. STEVE ELKINGTON: A set of sheep. What do you call-- what do you call a big group of chickens? We-- he was calling it a set. -A flock? Is it a flock of chickens? STEVE ELKINGTON: A flock? You know, I don't know if I've ever been in a place as quaint as Sonoma. And your place-- I just don't know if you could ever get a better spot to live. One of the things that you've always talked to me about when you swing is you've always haven't liked this elbow position. -I have a big flaw. And the big flaw is I get the chicken wing going. -So I get that out. For years, I have taken the club back and closed the face. And I get the chicken wing going from that. -Gripping way back in the palm here is a no-no. And what it does-- it puts that elbow in a position so the only place you can go is up, up real high on the back swing. We want to get that finger down and the tip so that the palm of the hand is going where you're going. And what that will do-- it will change the joint here. -So what happens with his little tip is I can kind of open that club face a little, going back, which cements this elbow in. And that's a big deal. STEVE ELKINGTON: Now that your elbow fold-- and it'll want to fold. See and then you've got no wing-- no chickie wing. Look at that. That's a different feel, isn't it? -Very nice. Ooh, that was a good shot. STEVE ELKINGTON: Mate, I love this place you've got here. And it's a very civilized way of being in the afternoon, I think. Don't you? -It's perfect-- perfect wine for this day. -That was nice. And on the back of the ball it says the Grieve Family Vineyard is possibly the last undiscovered part of Napa Lovall Valley, which is only accessible via Sonoma. The cool climate and the alluvial soils are ideal for Sauvignon Blanc. Is that right? -That's what makes the wine so good. -Secret is in the dirt, baby. -So David, we're on number seven here at Sonoma Country Club. DAVID GRIEVE: We are. It's phenomenal. STEVE ELKINGTON: We have a three-hole challenge. And you're a one handicap, so I feel like you've got the advantage. Oh, that's a good swing, David. STEVE ELKINGTON: That's a good shot. DAVID GRIEVE: --get on there. Yeah, it went on. DAVID GRIEVE: Uh oh, I'm in trouble. STEVE ELKINGTON: That's floating in there quite nicely. DAVID GRIEVE: That's not going to do it. -Not bad distance. That could be a little tricky. You don't want to get one down to the pro in a smack down. DAVID GRIEVE: Oh, that's good. STEVE ELKINGTON: Mmm, see, you're probably some sort of a magician on these greens down here. DAVID GRIEVE: A David Blaine of sorts. 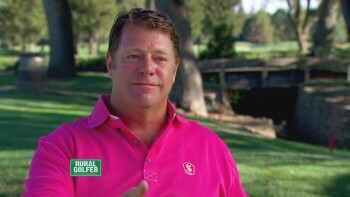 STEVE ELKINGTON: David Blaine of the Sonoma County. I'm feeling eagle. At least a bird. Ooh, down the tree line-- good hit. Beauty. -Wow, I think I made the green. STEVE ELKINGTON: That's a great shot. That was a 260 yard blast. Uh-oh, could be beach. DAVID GRIEVE: A little more work over there. -Beach-- I think I'm in the beach. DAVID GRIEVE: Elk, I'm a little worried about this shot for you. STEVE ELKINGTON: Mate, I've have been pretty good out of the bunker lately. DAVID GRIEVE: Uh-oh, now I'm in trouble. STEVE ELKINGTON: Oh! Whoa! Wow. STEVE ELKINGTON: Uh, do we do the Ryder Cup like good, good? DAVID GRIEVE: Well, it's a great finishing hole over a dry creek right now. In about a month, it'll be flowing like crazy. Perfect. It's all about the second shot putt. -Oh! That was Merlot. That was Merlot. Oh, no! STEVE ELKINGTON: Oh, he did it. STEVE ELKINGTON: He did it. DAVID GRIEVE: Shot. Good shot. STEVE ELKINGTON: Hmm, think I'm left, darn it. Oh, OK. OK.
STEVE ELKINGTON: You know, at least the long-ball did a back flip, which you want. I'm-- I can't wait to see what happens if you make this. STEVE ELKINGTON: OK, it's all right. You hold it for me. Hmm. DAVID GRIEVE: Too far out? STEVE ELKINGTON: All right. OK, I think we should call it a draw. DAVID GRIEVE: Yes, we should. -Hey, I really enjoyed it. And you were a gentleman. -And thank you for showing me all the tips on my right hand. -I think-- I think we should go in and test your wine one more time. CHILDREN'S VOICES: Elk's vintage vault. -When we hit that chip, got my line. I push that club back with my feet. OK, so I've got to load-- the load something. Load it. Hold it right there with my feet. I'm holding that club against that with my feet. And on the way down, when I change directions, I'm holding against that with my feet. My feet are pushing that way. On the side, my feet are pushing that way. So I have a little, slight bit of pressure on the back-swing. My feet press this way and then they reverse. So that gives me that drag-- that drag feel. And I can really tune in on the flag. -You can't walk out of the shot. Come here. -I got him. Brick, I know you want to play ball. -Hey, Brick-- I missed it. I missed the flick. -He's going to do that-- he's only going to do that another 350 times. -It's the slobber that's got me going. -All right, here we go before he comes back. Yeah, there you go. Now hold right there. He's going crazy, that dog. I'm in. Let's go. NARRATOR 1: On the next episode of The Rural Golfer, we take an all access tour of Elk's home away from home. STEVE ELKINGTON: Four times bigger than the biggest bus on the road. MAN 2: And it is so unique. The only way to explain it-- it's just the top of the line luxury RV. STEVE ELKINGTON: We call it the Big Show because there's no other way to describe it correctly. I'm able to live in it while we're playing on the tour. And I get to do the same thing. I've got my own sheets. And I got my own place I can cook. MAN 3: He has really done a heck of a job inside that trailer. You know, it is beautiful. And that is Elk. STEVE ELKINGTON: When you come up from golf, you've got to have a big shower. Had to have a booth. I love booths. I put my gold putters back here. I have a little putting green there. I think just having the nice things that you're used to having when you're at home-- I think that's more important on the road than anything, to be honest.